Christmas party season has crept up on us once again, so for those of you who are still looking for something show stopping to sparkle in this season, M&S have a great selection of party outfits options to inspire. From let our buyers guide to M&S’ top five party outfits help you find your perfect party style this festive season. 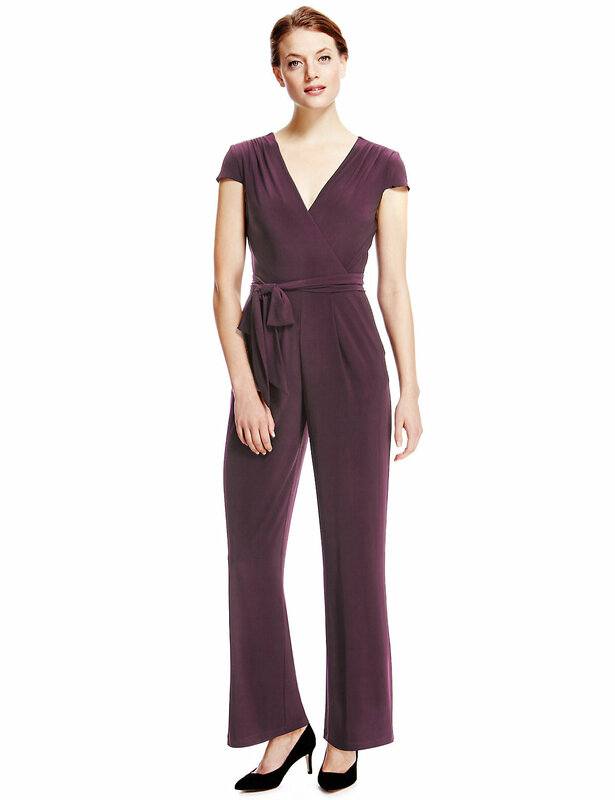 Jumpsuits are a great choice if you want something that feels effortless. The tailored features of this style make it particularly flattering – the tie belt defines your waist the wrap front is forgiving if you have to fit in a 3 course meal! This piece is also available in classic black, but we prefer the seasonal berry hue. Our verdict? Great for your partner’s Christmas party. This cocktail dress offers a festive twist on the classic LDB, with the tactile mix of sequins and velvet feeling particularly glamorous. The bodycon fit is unashamedly feminine, but the length comes to just above the knee which stops this dress from looking too ‘try hard’. Our verdict? One for the office Christmas do. Per Una’s tunic dress is a great, versatile piece for your winter wardrobe. The simple cut is perfect for day, while the placement embellishment adds just enough sparkle to take you through to drinks in the evening as well. We also love the festive bottle green colour! Our verdict? Perfect for day-to-night styling. This top is another mix-and-match staple. The delicate floral lace and scalloped edging are elegant and feminine, while the sparkle detail adds a festive edge. Style it with a plain skirt during the day, or with jeans and heels for a night out on the town. Our verdict? Wear for drinks with the girls. If you’re looking for one standout piece this season, then this skirt is sure to get everyone’s attention. Its copper tone feels more individual than typical gold and silver sequins, and it will transform even the simplest of tops. Our verdict? Great for adding some sparkle to a dinner party outfit.